And then you think -- 'Hey -- shouldn't I wait for that five-disc edition to come out? I bought something like three copies of The Fellowship of the Rings ..." I am going to sort all of that out for you. The Watchmen Director's Cut comes with two discs. On disc 1 (the cut itself): 24 extra minutes of Nite Owl, Dr. Manhattan, the Comedian, the Silk Specter II, and Rorschach. What is in that 24 minutes? Well, a lot of stuff. Mostly just extensions; but there is the Nite Owl 1 beat-down scene -- somehow I felt the movie was probably improved by for not showing me. There is an unnecessary, and wisely cut, scene of the cops finding Rorschach in the Comedian's apartment. He knocks one out, and the other takes a bunch of shots at him -- which, due to camera focus, is not clear how he survives. If I didn't know better, I would think he was bullet proof from that scene. We see some "Rorschach wanted footage" in the old Nite Owl talks to the new one scene, so we get a description of the Keene Act. There is a Rorschach walking down the street scene with more Rorschach monologue that underscores he will never, ever surrender. Well, not even in the face of anything. There is a government agent's question, the Silk Specter II, and some more Eddie Blake flash-back. There is some "we found Dr. Manhattan on Mars" stuff from science geeks. There is an absolutely unnecessary extra clip of Videt's secretary getting her fingers shot off in the assassination scene. There is more, and it is definitely unnecessary. While I consider Watchmen a triumph of filmmaking and turning the book into a movie, I truly do not believe we were going to get a better shot at it); it is clear that editing was kind to the movie. Being it is already long, it is not improved by the additional material -- much of which does not appear in the books, and some of which is simply gratuitous. It is also missing the all-important Director's Commentary, which is at least half of what I would want from a "Director's Cut". The second disc contains a MCR video for the show, 'webisodes' (available, as you would guess, from the web), and a documentary which has interviews with people from DC comics about how revolutionary Watchmen (the book) was. This is actually good -- although it is hurt seriously by the lack of Alan Moore who does not cooperate with studios after a falling out with DC Comics. However, what is interesting and good about this, is not the discussion -- which is okay, although does not get high marks -- but the animated video shorts, which take Dave Gibbon's (the Watchmen artist's) work, and well, "animate it". This gives us a tantalizing and brilliant look at what a straight-out-of-the-novel (and I mean straight-out- of-the-novel) cartoon would look like. The second disc is worth it just for that. But here's the real problem. Inside the box is a note for 10 bucks off the ultimate edition. This is interesting; they presume that (a) you have bought this, so you are a Watchmen fan, and (b) you will (maybe) buy the 5-disc edition with director's commentary, the rest of the motion comics, and a bunch of other stuff. So really what they are saying is, "Thanks for this --and, we know you are going to get the big enchilada when that comes out." Well, if you're a fan, you probably should, but I would pass on this one. The extras (especially without Director's Commentary) just aren't compelling enough in the face of a really deluxe set that will have that stuff. If I showed this to someone for the first time, I would rather show them the theatrical release than the Director's Cut, which doesn't bode well for selling this edition. 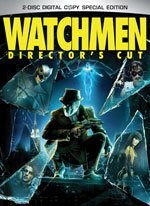 Download Watchmen (Director's Cut) from the iTunes Store in Digial HD. For more information about Watchmen visit the FlickDirect Movie Database.